Falcon Acoustics recreates 1974 BBC LS3/5A prototype speakers for limited run | What Hi-Fi? Falcon Acoustics has announced that it’s re-making the BBC’s first LS3/5A speakers for a limited edition run, giving 50 hi-fi enthusiasts the opportunity to own a slice of loudspeaker history. The handmade replica is allegedly the closest possible recreation of the final ‘no compromise’ prototype created by the BBC two years before the speaker’s first commercial production in 1976. It’s called the ‘Kingswood Warren’ Limited Edition - a tribute to the BBC’s Kingswood Warren Technical Research Department, where the LS3/5A first took shape, and representing their limited, 50-pair run. Falcon hasn't approached this project half-heartedly either, commissioning several components to secure the Kingswood Warren Limited Edition’s authenticity. Falcon’s founder Malcom Jones designed the original KEF B110 and T27 drivers as chief design engineer at KEF, so they have been reengineered using authentic recommissioned materials. The prototype’s crossover was created from transformer-style inductors using a size of radio-metal lamination that is no longer available, but Jones had enough material to be able to replicate those key components. The capacitors also used material not available today, however apparently after three years of searching, Falcon hunted down a limited supply of the film and has been able to use Falcon Polycarbonate capacitors to re-create the BBC crossover from 1972/74, which was used in the final LS3/5A design. 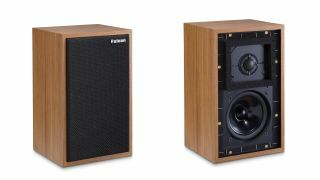 Falcon has used the original BBC LS3/5A cabinets Nos 3 and 4, made up of graded and damped 9mm Baltic Ply with screw backs and a Teak veneer finish. It also used handwritten notes from BBC engineering staff to guide production. Bespoke rose-gold plated terminals and an antique-leather, front-folding presentation case complete this Limited Edition of 50 pairs, one of which will be presented to the BBC. The ‘Kingswood Warren’ Limited Edition LS3/5A speakers will make their UK show debut at the Bristol Hi Fi (Room 430), and will be available to buy from next month (while stocks last, of course!) for £6495 per pair.